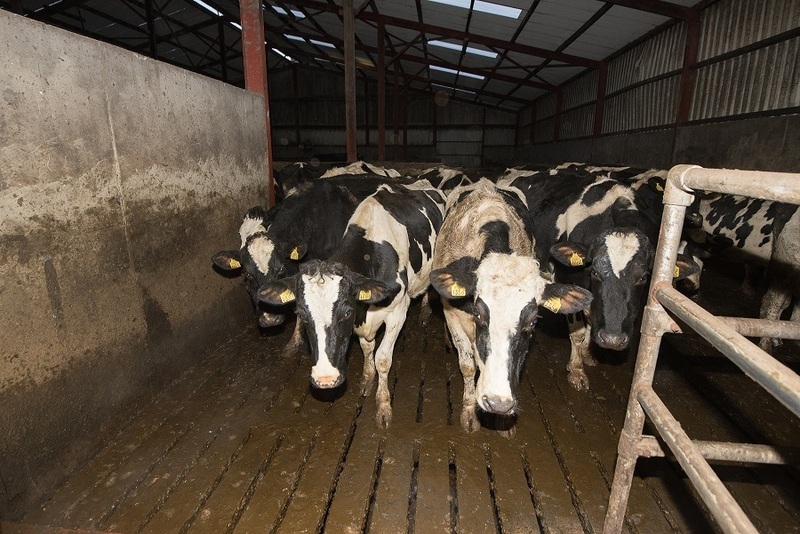 Cows enter the milking parlour at PJ McMonagle's dairy farm near Raphoe in County Donegal. Picture by Clive Wasson for The Irish Times. As the UK prepares to leave the European Union in just three months, The Detail tracked the journey of milk processed by Ireland’s oldest family dairy company. We followed the milk from County Donegal to County Tyrone then back across the border into County Cavan and examined the impact a no-deal Brexit could have. MILK is big business on the island of Ireland. The value of the Republic of Ireland’s milk output is forecast to be €2.47bn this year, according to initial estimates of Ireland’s agricultural operating surplus that were published by the country’s Central Statistics Office (CSO) earlier this month. That milk came from over 1.4 million dairy cows, latest figures (June 2017) show. It is a similar picture in Northern Ireland which was home to 310,700 dairy cows in June this year, according to the most recent agricultural census carried out by Stormont’s Department of Agriculture, Environment and Rural Affairs (DAERA). Figures published by DAERA in January this year show dairying remains the largest contributor to the total value of gross output for agriculture in Northern Ireland at £662m in 2017 – an increase of 46% from the previous year. Raw milk production from farms in Northern Ireland during 2017 was 4% higher than in 2016, reaching a record volume of 2.3 billion litres – up from nearly 2.2 billion litres. The outcome of the vote on the Withdrawal Agreement in Westminster’s House of Commons by MPs in January 2019 will have a major impact on the dairy industry. There are fears that if the UK is unable to agree a deal with the EU, it could mean the return of a hard border in Ireland and the introduction of tariffs on goods exported and imported from Northern Ireland. 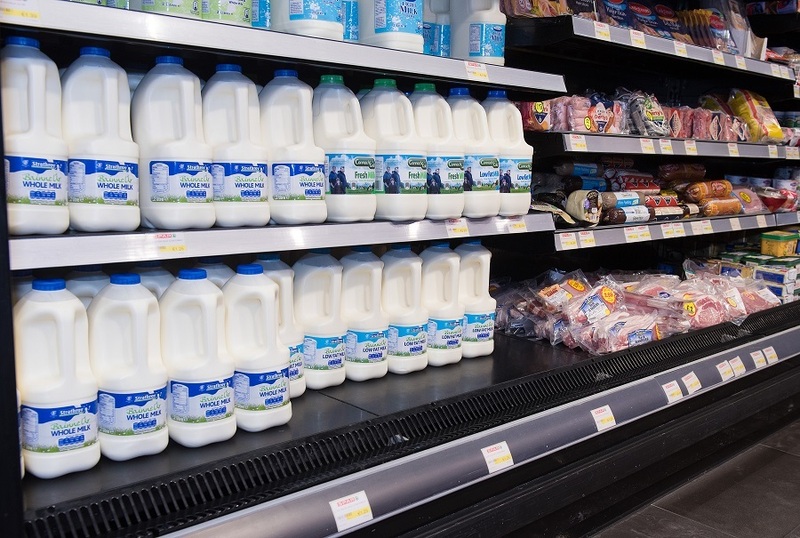 As the country waits to see if Parliament will approve Prime Minister Theresa May’s deal, The Detail followed the journey of milk in Ireland to show the extent the industry operates on an all-island cross-border basis. The journey of milk from The Detail on Vimeo. Milk is taken off a lorry at Strathroy Dairy in Omagh. Picture by Clive Wasson for The Irish Times. A Northern Ireland dairy processor which relies on farmers in the Republic of Ireland to supply around 60% of the milk it sells has warned of the dangers of “crashing out” of the European Union (EU) without a deal. 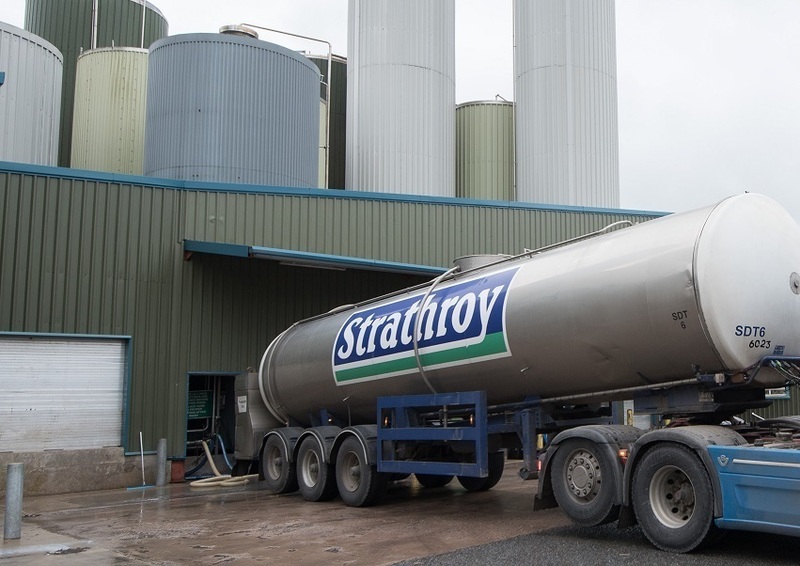 Strathroy Dairy Ltd processes all of its milk at its plant in Omagh, Co Tyrone, before it is delivered to over 2,000 retailers across the Republic and around 400 in Northern Ireland via a network of distribution depots. Of the 257 farms across the island of Ireland supplying milk to the firm, 82% – or 211 – are based in the Republic while the remaining 46 are in Northern Ireland. The family-run company imports around 100 million litres of milk from the Republic every year. All of the milk it collects from dairy farmers there returns across the border after being processed in Co Tyrone, while the rest of its milk is bought and sold in Northern Ireland. The family business now fears a no-deal Brexit could force it to invest millions of pounds into a second plant south of the border which, it warns, could result in its Northern Ireland workforce being halved if it has to move part of its operation. Strathroy's commercial director Eamon Lynch said: “It’s never something we’ve needed before because we have the capacity in Omagh and because we have a distribution network throughout Ireland. Now we have to think about it because of Brexit. Mr Lynch explained: “Current World Trade Organisation tariffs are particularly penalising on the agrifood sector and as much as 30% on milk. This would add a level of cost that would be potentially crippling. Add to that the additional paperwork and bureaucracy that a no-deal scenario would entail. The milk market is incredibly competitive and the smallest increase in costs can negatively impact on already tight margins and the ability to compete in the marketplace. “If we were to increase our price by a penny on a jar we could potentially lose contracts over it. Owned by the Cunningham family, Strathroy has been making dairy products in Omagh since 1850. It supplies to a range of wholesalers and shops, including Lidl, Supervalu, Tesco, Sainsbury’s and Costcutter. The all-Ireland business does not just rely on the EU’s free movement on goods and tariff-free rules for its milk and cream products but also for its milk cartons which it makes on site using plastic beads imported from the Netherlands. A map created by The Irish Times showing the journey of PJ's milk which crosses the border twice before it reaches the shops. The company’s workforce of around 200 employees is made up of people who live on either side of the border, as well as a number of European nationals, although this second group has dwindled over the past two years, according to Mr Lynch. He said: “I think a number of them always had the intention of going home again at some stage which is understandable. They were here to do a job and maybe, depending on which country they’re from, the time was right for them to go back. Strathroy’s commercial director explained his company was not in a unique position as there are other dairies who buy milk in Northern Ireland and process it in the south. “It works both ways,” he said “which is probably why businesses, the Confederation of British Industry (CBI), farmers’ unions etc have been talking very vociferously in recent weeks about the importance of actually agreeing to the deal that is currently on the table in relation to Brexit because of the impact a no deal can have on business. The unknown future has been a deterrent to business investment, Mr Lynch explained. “It’s the uncertainty. It’s difficult for any business to actually invest money at the moment on any site. We always want to be updating and improving what we have on site and it’s difficult to know or to justify investment when you don’t know exactly what the future holds. Dairy farmer PJ McMonagle was the first to supply Strathroy Dairy with milk from the Republic of Ireland. Picture by Claire Smyth. PJ McMonagle supplies Strathroy Dairy in Northern Ireland with around 800,000 litres of milk every year from his farm in Co Donegal. The produce from his 120 cows crosses the border twice before reaching the shops. The 51-year-old previously supplied a creamery in the Republic but as a result of low milk prices the farmer decided to move to the Omagh company over eight years ago. Now he is faced with potential disruption to his business as the UK finalises the terms of its withdrawal from the EU, which some fear could result in the return of a hard border between Northern Ireland and the Republic. Mr McMonagle’s 250 acre-farm is located just one mile outside the east Donegal town of Raphoe, approximately 10 minutes away from the border into Northern Ireland near Strabane. 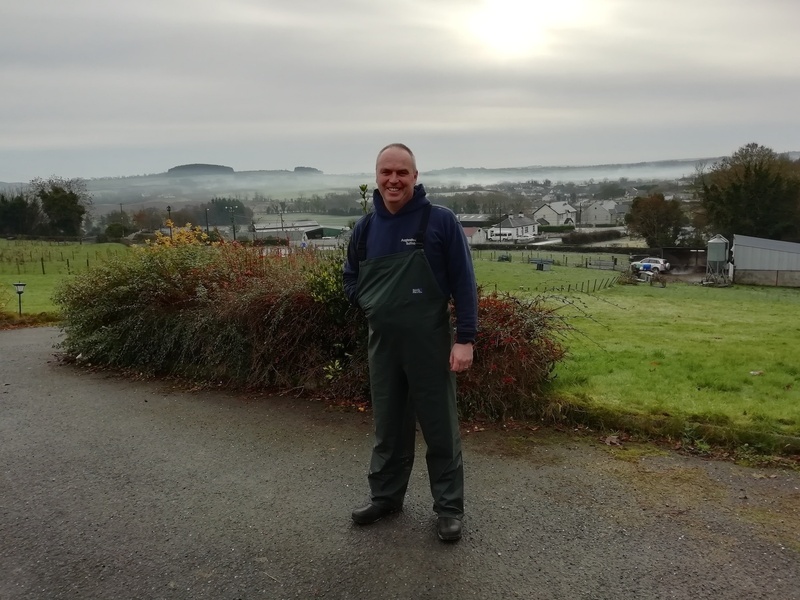 He believes some of his northern counterparts in the dairy industry might have voted to leave the EU due to its strict farming rules including controls around slurry spreading and time-consuming paperwork. The father-of-three, who was the first farmer in the Republic to sell milk to Strathroy Dairy, told The Detail: “I’ve spoken to people in the north who voted to leave and they said if they’d sat back and looked at the situation right they wouldn’t have voted that way. However, Mr McMonagle is critical of the amount of EU bureaucracy farmers currently have to deal with. “The EU needs a bit of a wake-up call because the red tape has got unreal as far as farmers are concerned,” he said. Despite these concerns, Mr McMonagle credits the EU with improving food traceability for the consumer and fears what could happen if tariffs are introduced on products crossing the border post-Brexit. He currently receives a base price of around 31 cents plus VAT for every litre of milk he sells to Strathroy, which then sells a two-litre jar in the Republic at around €1.50. “If there’s a tariff on that milk it’s going to be at a higher price so people are going to buy a similar product that’s cheaper,” he added. Male calves born on Mr McMonagle’s farm are sold to local beef farmers or exported to the Netherlands via England to be sold as veal – which he fears could potentially face long delays as a result of increased animal welfare and customs checks after the UK leaves the EU. He said: “A hard border would be the worst-case scenario. I do business in the north, buy animal feed in the north, my milk goes to the north. Being so close to the border, you’re using contractors coming out of the north, you buy some of your parts in the north. “It’s much easier to get to Strabane or Derry than it is to Dublin. We’ve always been aligned to Northern Ireland rather than southern Ireland so the minute you put up a hard border it’s just a nightmare. “I would hope we could continue as we are but selling our product will probably become more difficult if there’s any kind of a tariff between us and England. “If you want to sell sheep meat or beef, and maybe even milk, and they put any kind of tariff on that then I’m not getting the price for my product so that puts my business under pressure. That’s what I see happening. PJ McMonagle during the milking process at his dairy farm in Aughnakeeragh, Co Donegal. Picture by Clive Wasson for The Irish Times. Farming is in PJ McMonagle’s blood. He knows no other way of life. The dairy farmer’s holding at Aughnakeeragh is just seven miles from the border with Strabane in Co Tyrone. Just south of Raphoe lies the Bronze Age Beltany Stone Circle which could be seen as testament to the fertile region’s long agricultural history – Beltane being the anglicised word for the Gaelic May Day festival when rituals would have been performed to protect the local cattle and celebrate the return of summer. “I grew up on a farm,” explained PJ. “I took over the farm from my father in 2002. He milked cows before that. Daddy got the farm off his father. The Irish Land Commission was responsible for re-distributing farmland in Ireland and PJ’s family eventually grew the 14 acres it was given to the 250 acres he owns today. Not only has the size of PJ’s farm changed but so has its outlook. PJ, who chaired the Donegal branch of the Irish Farmers’ Association for four years until 2015, said: “In my grandfather’s time all farms were self-sufficient. They had milk. They had meat because they killed one of the animals. When I was young we would have killed a lamb or a pig. My grandfather had a vegetable garden. Farms years ago were almost self-sufficient. My grandmother made homemade bread and butter. Today PJ keeps 120 cows for milking, along with 50 sheep and some Connemara ponies, although he only milks just over half of his cattle during the winter. 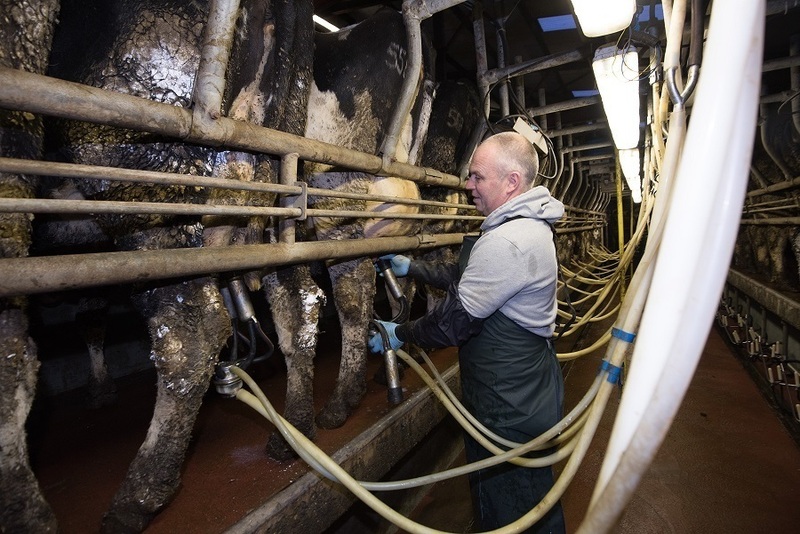 As the debate continues over the UK’s future relationship with the EU, The Detail spent three days following PJ’s milk from the cows on his farm to the processing plant in Northern Ireland and finally to shops in Cavan. The Detail’s footage, filmed in December 2018, shows how integrated the dairy industry on the island of Ireland is through the journey of milk as it criss-crosses the border between the Republic of Ireland and Northern Ireland. A thin crescent moon is still visible in the black early morning sky, nestled amid a blanket of stars, when we enter the milking parlour at around 6am on a frosty Tuesday in December for the first milking of the day. The 220 by 110 sq ft structure was built in 2009 as a place to keep cattle during the cold winter months and allows dairy farmer PJ McMonagle to milk and house them under the same roof. The gates to the milking parlour are opened and 25 cows enter at a time, aligning themselves side-by-side along the stalls. As the cattle feed on nuts, PJ attaches automatic pumps to their udders and the milking begins. The animals will return to the parlour at 4pm the same day to be milked again. Around 500 litres of milk will be taken from 75 cows in any one milking session which means there are approximately 2,000 litres waiting to be collected from PJ’s farm by processor Strathroy Dairy. There are strict rules around what temperature the milk is allowed to be stored at and it is not permitted to contain any antibiotics. Andrew Nesson from Strathroy collects milk from PJ's farm in Co Donegal. Picture by Clive Wasson for The Irish Times. Strathroy Dairy collects PJ’s milk every other day and it is pumped into a tanker with milk from around half a dozen other farms located in the Republic. The driver takes a sample from each site he visits and if the milk fails to pass the testing stage at Strathroy’s Omagh headquarters the origin of the contamination can be traced. This rarely happens but could prove costly for the unfortunate farmer whose milk contaminated the tanker as they would be expected to cover the cost of the entire rejected load. 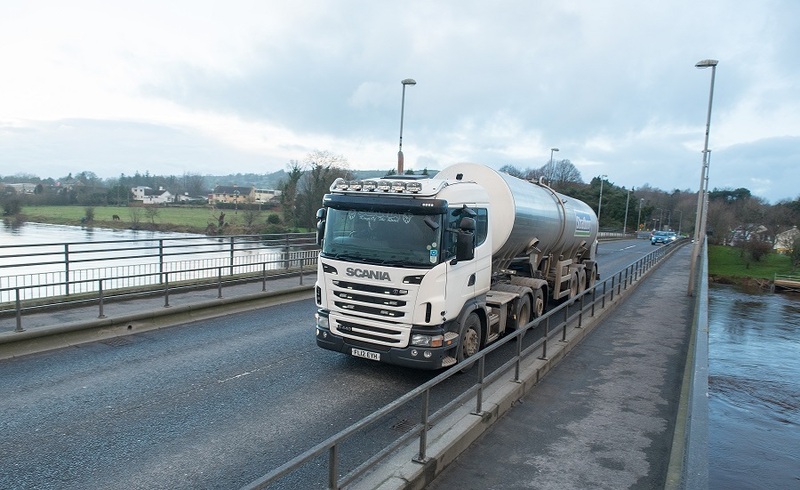 Milk collected over two days is taken from PJ’s farm at around 2pm on Tuesday and it will travel at least 28 miles – longer if the tanker has other farms to visit - before it reaches Strathroy’s processing plant in Omagh. It will cross the border into Northern Ireland around 15 minutes into the journey if PJ’s farm is the last collection point on the driver’s route. PJ's milk crosses the border from the Republic into Northern Ireland to be processed in Omagh. Picture by Clive Wasson for The Irish Times. The Republic of Ireland exports 90% of its dairy products to over 130 countries worldwide with the UK accounting for around a quarter of its total dairy exports, according to Bord Bia. The country exported 93,354 tonnes of milk, worth €24.5m, to Northern Ireland during 2017 while 661,821 tonnes of milk with a value of €221.8m travelled in the opposite direction, according to the Republic’s Department of Agriculture, Food and the Marine. A spokesperson for Stormont’s Department of Agriculture, Environment and Rural Affairs (DAERA) told The Detail it could not provide information on the volume of milk to cross the border. However, according to the 2017 Statistical Review of Northern Ireland Agriculture, all of the raw milk produced in Northern Ireland during 2016 was sold to the Republic at a value of £116.7m. According to the report, which DAERA said is the most recently-published review, this accounted for half of all total external sales and 63% of total export sales from farms in Northern Ireland. All milk bought by Strathroy is processed in Omagh however milk from the Republic will be kept separate from milk sourced in Northern Ireland. Strathroy’s commercial director Eamon Lynch explained: “We’ve built a supply base in the Republic because we needed the milk pool and also recognise the importance of supporting farmers across all of Ireland as it is also our marketplace. Over a period of time we’ve very much grown our supply out of the south which is also in line with our sales growth there. “Quality local produce is important to both retailers and consumers. 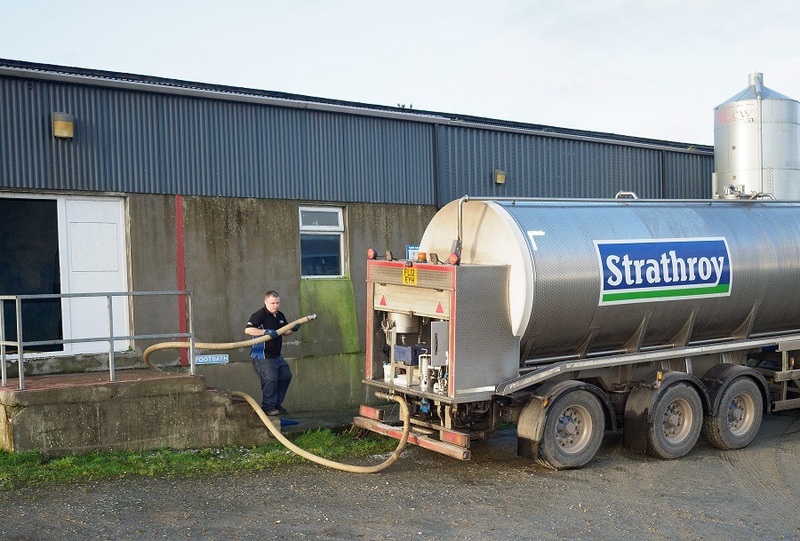 With Strathroy milk, no matter what part of Ireland they are in, they are assured that their milk is from Irish farms, north or south, and processed to exacting standards in our dairy in Omagh, with depots throughout Ireland helping to guarantee the most efficient delivery service." The first port of call for Strathroy’s tanker drivers is a small lab to the front of the main building at the Omagh plant where a sample of milk from each load undergoes a number of tests, including checking acidity levels and temperature. After getting the all-clear from the technicians, who trained at an agricultural college in Loughry, Co Tyrone, the driver can offload the milk he has collected and processing can begin. Business at Strathroy has finished for the day by the time PJ’s milk arrives shortly after 4pm on Tuesday so it will be stored until the next morning when processing begins again. It take seconds for plastic containers to be filled with milk at Strathroy Dairy's Omagh processing plant. Picture by Clive Wasson for The Irish Times. Around 10% of raw milk is cream which is removed and re-added during processing. The amount of cream added to the milk will depend on whether the final product is full fat, semi-skimmed or skimmed milk. Strathroy also sells cream products. Approximately 85% of the company’s milk is sold in two-litre plastic containers which it makes on site using plastic beads it imports from the Netherlands. 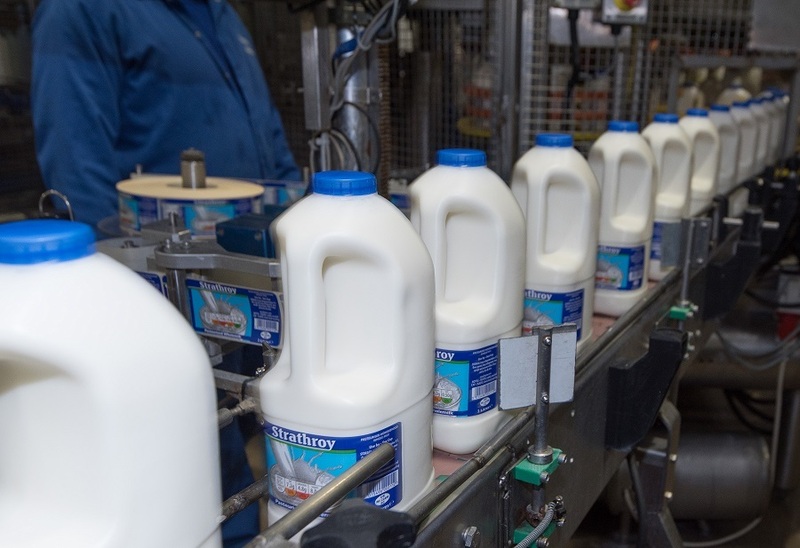 It takes seconds to fill a jar with pasteurised liquid milk which then moves quickly along a noisy multi-tiered production line to have a label added by a machine before it is loaded onto trollies that each have the capacity to hold around 80 two-litre containers. A 40ft lorry awaits beside an adjoining warehouse and typically transfers around 104 trollies – or 8,320 two-litre jars – of milk to a network of distribution depots around Ireland. PJ’s milk is included in a load bound for Cavan. 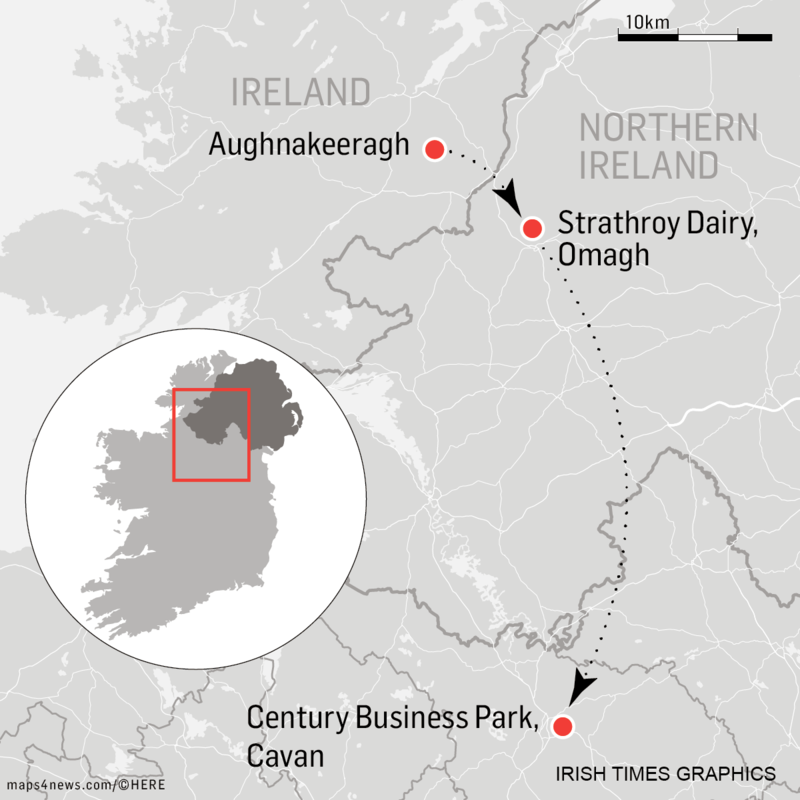 The 55-mile journey between Omagh and Strathroy’s distribution centre in Cavan should take around an hour and a half, with PJ’s milk crossing the border back into the Republic just over an hour after it leaves the processing plant. On arrival, the trollies will be taken into the depot to be stored overnight before the milk is delivered to local retailers on Thursday morning. Loading the delivery lorries begins at 4.30am on Thursday with the first shop receiving its supply of milk half an hour later – around 48 hours after it was milked from PJ’s cows. A lorry with a full load will contain an average of 3,500 two-litre containers of milk and a busy day could see it deliver to up to 50 different shops in the Republic – more than twice the 20 retailers to receive a daily delivery of Strathroy milk from one lorry in Northern Ireland. “As we operate now there is no border as such so anything that can put a hiccup or hindrance on that is going to impact negatively on how we do our business,” Strathroy’s commercial director Eamon Lynch said. “We are all working under time and efficiency pressures with booking in times etc to meet at depots all over the country. At present, all of that works very smoothly and that is how the business world would want that to stay." He added: “It’s been very easy because north or south of the border we’ve all been in the same trading block – we’re all part of the European Union. Everything moves freely backwards and forwards. If we lift milk in Strabane or Lifford, it doesn’t matter to us. “Suddenly [post-Brexit] we might have to be thinking about that in a totally different way because one might be costing us tariffs to bring milk across the border whereas the other is being collected free of duties. PJ's milk arrives in a shop in the Republic around 48 hours after it is taken from his cows. Picture by Clive Wasson for The Irish Times. Camera and editing for 'The journey of milk' film by Ryan Ralph. A version of this story also appeared in today's edition of The Irish Times. What would a no deal look like?